Everybody hates a tourist, right? No one hates tourists more than the environment though. Tourists have the power to completely revitalise the environment. We can make a positive difference to the culture, wildlife and environments we visit on our travels, flip flops in hand. Here, in this super long but rewarding article, you can find out how. Sustainable tourism, what on Earth is it? The principles of sustainable tourism are simple when you break them down. Tourism is travelling, sightseeing and all the other holiday activities you enjoy. Sustainable means that it can continue – often indefinitely. To have sustainable tourism is to go on holiday and partake in activities that support the locals and environment in a way that preserves and encourages them. A sustainable and rather enjoyable tourism practice is for hotels to serve up seasonal food grown locally to guests. This practice supports local farmers and encourages them to grow the native plants and foods that the local ecosystem needs. The aim here is to enjoy the cuisine on holiday without causing damage. There are so many hidden ways you can find and encourage sustainable tourism on your travels. Eco-tourism – it sounds similar but there is a difference. Sustainable tourism can apply to anything – from choosing an eco airline to eating at a local restaurant. Eco-tourism only really applies to natural areas. It’s a small piece in the larger jigsaw puzzle of sustainable tourism. It’s about travelling to untouched, natural locations and focusing on providing direct benefits to the environment and native people that live there. Eco-tourism is a beautiful thing, but we don’t always fancy a hiking holiday through an area of natural beauty. Sometimes we want theme parks. Sometimes we want bustling cities. Sustainable tourism is ALWAYS an option. Eco travels is about enjoying your luxury in an eco way. Keep your footprint as small as possible. The benefits of sustainable tourism to the environment are huge. And not just for the planet. Sustainable tourism ensures that these travel luxuries will still be here for our kids to enjoy. You see, travelling is always going to leave a mark on the planet. Even the most green of eco holidays will leave a mark. The point is, it’s an opportunity. Use your eco travels to make a difference. Use your time on holiday to make that spent airplane energy worth it! Greenwashing is basically a con. One that you should avoid at all costs at home and on eco holidays. Companies, big and small, use green phrases to make them seem eco… when they’re not. What does ”eco-lodge”, “all-natural” and “organic” even mean any more? Greenwashing is just a marketing tactic to appeal to people who want to be more eco. But you wouldn’t fall for that. They put tourists needs before the locals. Screw the environment! It’s all about unskilled voluntourism places that are too short to make a real difference. Can’t answer your questions about their eco policies. Or don’t have eco policies at all! Use “eco-friendly” when describing their business, but don’t have processes/statistics/facts to back it up. Have fake or paid for green certifications (discover the real ones below). If they’re doing any of those, they’re greenwashing. But before we get ahead of ourselves, let’s first decide where we’re heading on our eco holidays! Don’t just look for the nicest beaches. Costa Rica, Colombia and Uruguay are wonderfully exotic AND loved by the Ethical Traveler for 2018 eco travels! Have you considered exploring your own country for your next weekend break? France, Malta and the UK (yeah!) all rank in the top 6 nations in the Environmental Performance Index. These countries are great for environmental health and ecosystem vitality. Plus, you can get there by car! We don’t need to tell you how bad airplane journeys are, do we? Joking aside, flying still remains the most pollution-creating way of travelling. Airlines contribute 2.5% of global carbon dioxide emissions. But there are some silver linings to see from your airplane window. If you’re on a direct flight, well done! The more layovers on your journey, the more fuel wasted. If you’re on a Boeing 787-9, Airbus A350-900 or A319, you’re on a fuel-efficient aircraft. And if you’re travelling with a low-cost airline, like Ryanair, you just won the eco-lottery. Even if it feels quite the opposite. They’re one of the most eco-friendly airlines! Who are the most eco-friendly for Transatlantic flights. Because sometimes you’re craving some far off tropical destination, and France just won’t cut it. If you’re travelling a Transatlantic flight halfway around the world, all’s not lost. Buy carbon offset! Pay for the amount of carbon produced by your journey and that money will be sent to projects that reduce atmospheric carbon. Stick to economy. More leg room = less passengers = higher fuel-per-person. Lower your shades. Keep the sun out, keep the plane cool and save energy on AC! And another trick to keep up your sleeve. Find the most eco- flight with Alternative Airlines. 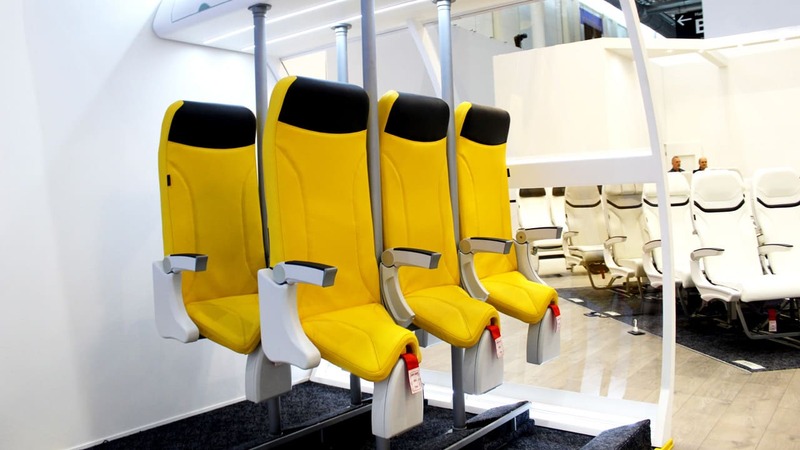 Hopefully it’s only a matter of time before Airplane Saddle is a reality! Would you be happy to stand for the whole flight instead of sitting? More people on a ‘standing only’ plane, lower fuel-per-person. Everything short of a space rocket is greener than flying! For small groups, rent a small car. Find a green renting car company, like Green Motion, or simply share a car. In some countries car sharing remains a common, safe and efficient way to green travel. For couples and solo travellers, trains beat cars! … but standard coaches and trains are far more eco- than flying. Plus they’re comfortable, cheaper and sometimes have Wi-Fi. If you’re lucky. It will take longer to get from A to B, but that’s just more time to enjoy the scenery, right? Not the best for eco travels, but still better than flying. A long, relaxing river cruise is a great way to green travel. Especially if you’re crossing Asia, where huge rivers cross various countries! Follow the steps of Rudyard Kipling and take the “Road to Mandalay“. Green accommodation isn’t just camping! Flying to a fantastic eco-country and staying in a careless hotel. Avoid the excessively luxurious hotels. Those excess luxuries aren’t needed. Fresh towels every day is an eco-nightmare. And that’s before we discuss the single use, plastic wrapped shower gel bottles. Homestays and guest houses are cheaper and generally more eco! Plus you’ll stay with the locals. And get great advice on places to eat (or avoid)! Even in developing countries, guest houses are best. Lower tourist-turnover makes them cleaner. Not some underpaid, overtired receptionist. Furthermore, they’re cheaper and very easy to find. Check out Ecobnb before Booking.com. No large gardens or golf courses – these require an absurd amount of water! Eco-friendly policies are easy to find and proudly displayed on their website. Seals of approval from green certifiers. Details about the hotel sustainability manager (a very real job for truly eco-hotels). Solar panels or other eco-energy suppliers powering the hotel. Local, organic produce used in the hotel kitchen. Employing local people – a great sustainable tourism policy. Recycling bins – used by the hotel is good, but in your hotel room too is better. More than just reusable towels – this should be a standard feature. Show facts and proof, rather than “eco” and “natural” claims. A truly eco-hotel will shout their eco policies loud and clear! Look to Qbic and The Zetter for a great example of hotel waste and water management! Don’t fall for a scam! Find hotels that are genuinely certified, not hotels that have paid for their seal of approval. But with local certifiers too, it’s easy to get lost. Check out the list of recognised standards that adhere to the Global Sustainable Tourism Council. Keep in mind: Having (or not) green certifiers isn’t always the absolute proof of the eco-friendliness of a hotel. Head to Bookdifferent to see all the accommodation at your destination ranked for eco-friendliness. Then stop at TripAdvisor to see their GreenLeaders – a feature to see if the hotel has eco-friendly practices is more than welcome! Professional tour company, or independent local guide. Big companies leave a big online footprint. Research these companies on TripAdvisor, Lonely Planet and Nomadic Matt – look out for comments about their eco policies, or lack of. Check the International Ecotourism Society to see if they recognise the tour for responsible tourism practices. Check if they employ local guides. Join small tours – big tour groups create big noise disruptions, damage and waste. Put the company on the spot. Ask them about their eco practices. What is their waste policy? Does the tour involve contact with wild animals? For small, local guides, it’s a little trickier. They might not have a website or a long list of online reviews. But, you can always talk to them in person! Quiz them about the tour to check their eco-consciousness. With small, local tours you’ll find they’re more willing to adjust their tour for you. Show them how it’s done eco-style! You’ll be rewarded with an eco-tour that’s tailored to cover everything you expect without any of the eco-damaging practices. Some activities will be more eco- than others… but here’s a list you should avoid at all costs! Swimming with dolphins in pools. They may look happy, but any wild animal shouldn’t be held captive for our entertainment. For dolphin swimming experiences that are biodiversity and sustainable tourism approved, you’ll have to meet them (naturally) in the wild. Riding elephants. Although they’re big, they’re not built for carrying human weights. To keep elephants docile, there’s a high chance it taken away from its family as a baby… or just beaten. Meeting ‘friendly’ tigers. These wild animals are often drugged so they’re friendly and beaten into being docile. Tigers are dangerous natural predators that belong in the wild. Hugging sloths and koalas. Not only will you be disturbing the koala’s sleeping habits and potentially stressing a heart-racing sloth to death with your hug, but microbes passed from humans can actually kill both these animals. Coral reef tourism. Stepping on, and collecting, parts of a coral reef damage the environment. Tourists are huge contributors to coral reef destruction, even if they just want to swim with the fishes! Human safaris. It’s just wrong! Local communities are not attractions. It’s humiliating. Slum tours. They claim to educate but what will you actually learn? What will the locals learn? Remote tribe experiences. Besides objectifying the tribe, frequent contact with foreigners puts the natives at a high risk of of catching a disease. Yes, it can be very bad! Unskilled and unprepared volunteers who paid well being sent to projects… and not being able to offer any help, or even causing more problems than they solve. Short volunteer placements (more paying volunteers = more profit) so volunteers don’t have time to develop skills and get work done. Lack of communication. You build a brand new school for an area that desperately needed a water well. In some communities, your free volunteering efforts are stealing jobs from local people. And watch out for fake volunteering organisations! Did you hear about the fake orphanages? Before you volunteer, do your research and only go for volunteer positions where your skills can really help the project. Do they have a sustainable tourism policy? Do they have a selection process? Famous places are famously un-eco. Maya Beach, made famous by Leonardo DiCaprio and ‘The Beach’ film is now closed indefinitely to tourists. 80% of the coral surrounding this beach was destroyed by tourist boats visiting the beach every day. And that’s before you see the war zone the beach had become, littered with waste and toxic sunscreen. Why go to famous places when you have to battle your way through the crowds for a glimpse of natural beauty? Not-so-famous locations can be equally beautiful and far easier to enjoy without the other tourists. The benefits of sustainable tourism to the environment extend to you too. Travellers and beaches alike prefer to be without the crowds of tourists. Let’s enjoy them before Chris Hemsworth sets foot there for his next movie. Besides, where’s your spirit of adventure? Adventurous spirits are quickly trampled by thousands of tourist sandals heading to famous locations. Angkor is beautiful… if you enjoy queueing for a glimpse of the sunset over the Angkor Wat Temple. Why not try the lesser known temples of Cambodia? What about Bagan in Myanmar? Also, when visiting a famous stony beach or cave, take a look at the stones within reach. Aren’t they smooth and lovely? The simple act of a thousand tourists reaching out to touch a stone, or stack one on another, can drastically change the environment. Finally, before booking your next trip or tour, think about destinations that actually need (and want) you. The heavier your luggage is, the more fuel it takes to move it! Pack light, compact and as little plastic as possible. Your sustainable travel destination might not have a great waste management system. Best to avoid creating waste as much as possible. Eco-sunscreen (the generic stuff is as bad for coral reefs as gasoline!). Filter straws for drinking tap water. Citronella as bug protection – live like a local! DEET is sticky and not good for the environment. Reusable food wrap for impromptu holiday picnics. As for the ultimate eco holiday clothes shop, head to Organic Basics (eco-undies), Prana, Howies, Thought or People Tree. It won’t be long before eco-clothes shopping can be done on the high street. Adidas and Patagonia are just 2 mainstream clothes starting to go eco. Bartenders love to put a plastic straw and paper umbrella in a cocktail. But the environment doesn’t love it so much. The US alone creates enough straw waste to wrap the circumference of the Earth twice! Switching everything off at the socket. That’s the eco holidays basic that everyone should be doing. If you use up all your food (not wasting a morsel) you can turn off the fridge too! Leave a note on the mailbox saying you’re on holiday and don’t need newspapers. Sustainable tourism applies to everywhere – including your own house. You are a guest, act like it! The same rules at home apply on holiday. And short showers, at that! Time your showers to match the rest of the hotel too. Waiting for the cold water to heat up as it reaches your shower is wasteful! Shower when the boilers are already pumping out hot water for other guests. Early morning and evening are your shower prime times for instant hot water! And air conditioning. Do you REALLY need it? If it’s just too hot to sleep without some air cooling, ask for (or pack) an electric fan. They use a lot less energy to power than air con (even modern eco air con). They don’t release harmful gases into the environment either. Still not feeling cool enough? A damp towel over your forehead + electric fan = super cooling! But don’t just focus on YOUR actions. What are other people doing on your behalf? Do you need your hotel room cleaned every day? Are the staff leaving individually plastic wrapped chocolates on your bed every time they make it? Are your towels so dirty that they just need to be changed every day? Let the hotel receptionist know about your sustainable travel requests, hang up the “do not disturb” sign, or just leave a polite note for housekeeping! This applies to electronic waste especially – safe recycling methods are rare in developing countries. Use plastic wrap and paper waste to package up your souvenirs. Head for a walk around the block! Green bins are usually recycling of some nature. Use Google translate to work out if you can put your trash in them. Psst. Now we’ve mentioned languages, here’s how to say “no straw please” on holiday! Cool language fact coming your way. There are 11 ways to say “straw” in Spanish depending on your destination! If that doesn’t work, gesture wildly at the straws and shake your head! Give back to local communities – it’s good for the soul! Always be polite to your hosts! Getting to know local tours and staying in guesthouses is very rewarding for you too. You won’t find local knowledge and warming hospitality in many commercial hotels. Even though you’re supporting these wonderful people and communities with the money you spend on holiday, you can (and should) take sustainable tourism a step further. Local places to eat are just so much better. All employed and supported by your visit. Ingredients grown in the fields surrounding the restaurant. Local cuisine, using locally grown ingredients, has a smaller eco footprint. Eating local is part of the green travel experience anyway. …you’ll be surprised at the warmth and gratitude you receive in response! Keep McDonalds for your post-holiday hangover (or never!). Support biodiversity and sustainable tourism by supporting local people! Not only are these beautiful, traditional souvenirs a little piece of an artisan’s soul. But they’re supporting local tradesmen and keeping a tradition alive. But without a demand for the native trees and traditional craftsmen, fast-growing trees are planted and traditional skills are lost as the locals head further afield for work. But don’t fall for a scam! Have you ever bought a bracelet at your resort in Spain only to meet someone else who bought the exact same one in Italy? And don’t buy souvenirs that harm the environment. Tusks, coral, shells, ivory and even leather (dog and cat leather can be deliberately mislabelled). Volunteering is a great way to get to know people beyond the travel-business sphere. You can learn a lot and help a lot! Be careful of scams and money-driven companies, but don’t shy away from the chance to help if you can. Learn the difference between volunteering and voluntourism. Volunteering can make your holiday that bit more rewarding. Go for the green alternatives. The views from an airplane are useless 90% of the journey anyway! Walking, cycling, even public transport is more eco. And the view can be phenomenal. Travelling alongside the locals is an opportunity to absorb the culture and pick up some travel tips. Cabs, although better than planes, are not eco. Who wants to get stuck in traffic trying to make small talk with a cab driver anyway? And if you get lost, well, that’s just part of the adventure. Planes are convenient, yes that’s true. But aren’t boats and trains just so much more fun? Use night trains and buses for travelling long distances. Or a boat if you can travel by water. The Danube can take you all the way from Germany to the Black Sea, stopping at Austria, Hungary and Romania along the way. Or just stay for longer in the same place! With Booking.com and other green travel sites at your fingertips, cancelling a hotel and extending your stay elsewhere is remarkably simple – and it doesn’t have to cost you. Pretty self explanatory, but here’s a quick sustainable tourism do’s and don’t’s list to remind you! Travel by train and coach on eco holidays where possible. Stay in eco hotels and guesthouses. Eat at local places and get to know the locals. Tour with local tour guides and ask for an eco/animal friendly tour. Volunteer with legitimate and useful volunteer programs. Check the tides before kayaking so you don’t get caught on reefs (see below). Read Lonely Planet to avoid cultural faux pas, e.g. dressing inappropriately in temples! Check out the best travel blogs for inspiration and sustainable travel blogs (such as Just Leaving Footprints) for more green tips. Throw all your eco practices out the window because you’re on holiday. Create excess waste to “treat yourself”. Try to catch turtles, fish and any other wild animal! Take starfish out of the water, even if you’re going to put them back. Get fresh towels and room cleaning when you don’t need it. Buy scam or eco-damaging souvenirs. Eat at McDonalds instead of local restaurants. Be ignorant of the local culture and traditions. These are just a few of the tiny things you should be aware of on holiday. Don’t worry too much if it goes wrong! Living eco is not about being perfect first time. It’s not always about sacrificing every comfort and luxury. Even a few small changes to your family holiday schedule can make all the difference to the world.